Fan Film Friday – NIGHT OF THE LIVING TREKKIES! I had originally planned to post this fan film the week of Halloween. Then the week of Halloween got VERY busy! And then there was Axacon. And then there was a week of blogging ABOUT Axacon! So here we are two weeks after Halloween, and I’m finally posting about a spooky (and hilarious!) zombie-themed Star Trek fan film. And guess what! 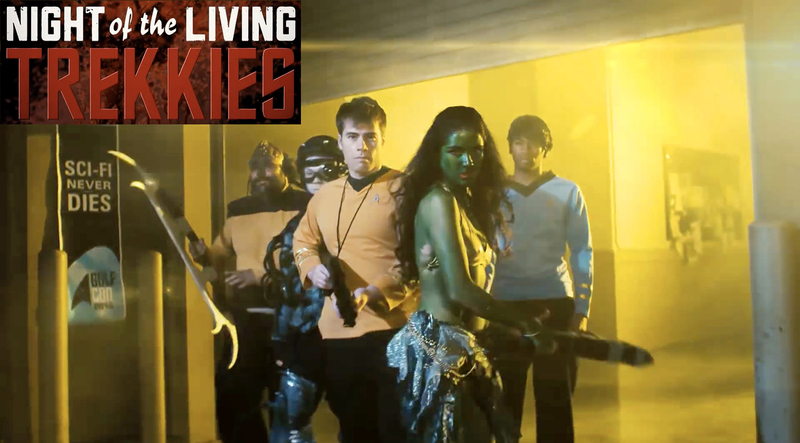 Next week, I’ll be posting about another zombie-themed Star Trek fan film! So I hope you all like zombies. Back in September of 2010, author KEVIN DAVID ANDERSON saw his novel NIGHT OF THE LIVING TREKKIES (still available in hardcover, paperback, kindle, and audio format) published by Quirk Books. A brilliant mash-up of a Star Trek convention and zombie movies, the book was filled with hysterical and clever jokes and references that Trek fans would get in a nanosecond (including giving all of the chapters TOS episode titles). For even more hilarious Star Trek (and genre) fan film shorts, visit the FUNNY STUFF page on my main blog site, Fan Film Factor.